No. 11/12 Virginia Tech defeated Miami 82-70 on the road on Wednesday night. The Hokies improved to 17-3 overall and 6-2 in the ACC with the victory, while the Hurricanes dropped to 9-11 overall and 1-7 in conference play. Wednesday night’s win marked the first time Virginia Tech has ever won six ACC games in a single month. Sophomore guard Nickeil Alexander-Walker had a big night, scoring 25 points to go along with five assists and an impressive six steals. He was 11-of-17 from the field and 3-of-7 from three-point range. He was one of four Hokies in double figures. Ahmed Hill added 19 points on 6-of-9 shooting, and he was a perfect 6-of-6 from the free throw line. Justin Robinson added 17 points, while Ty Outlaw had 11. As a team, the Hokies shot the lights out. They were 30-of-51 (58.8%) from the field, 9-of-19 (47.4%) from three-point range, and 13-of-15 (86.7%) from the free throw line against one of the ACC’s worst defensive teams. They also outrebounded Miami 28-27 and forced 16 Hurricane turnovers. The Hurricanes shot just 41.1% from the field, and 32 of their 56 shot attempts were from three-point range. Once again, the Hokies executed their gameplan of keeping the ball out of the paint. Miami led early in the game, but never by more than three points. The Hokies slowly took control over the course of the first half. Trailing 18-15, Virginia Tech went on a 10-0 run to take a 25-18 lead with 5:18 remaining. They went on to lead by as many as 10 in the first half, though Miami cut the score to 34-27 heading into halftime. The Hokies opened the second half with back-to-back three-pointers from Ahmed Hill and Wabissa Bede to make the score 40-27, and Miami never got the lead back to single digits after that. 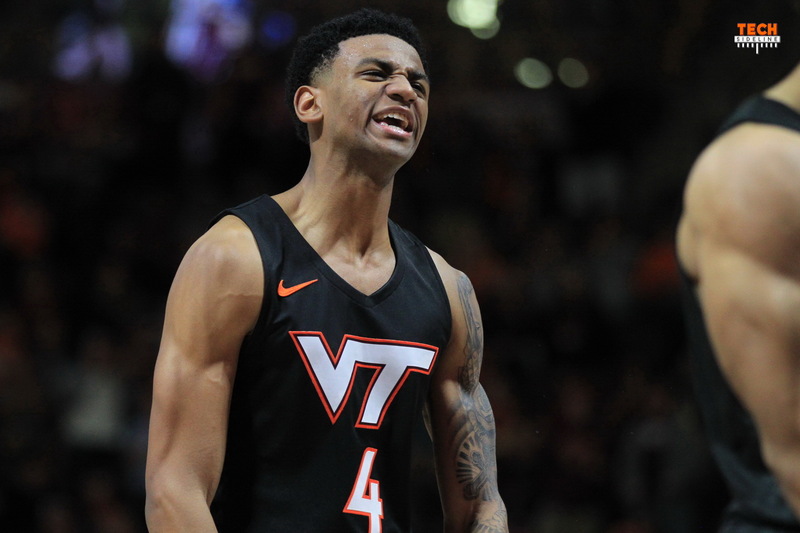 The Hokies went on to lead by 21 points on two occasions, the last coming with 8:46 remaining when a jumper by Nickeil Alexander-Walker put them up 68-47. At that point it was clear which team was going to win the game, and the Hokies weren’t particularly sharp defensively down the stretch, and the final score was not indicative of how much the Hokies controlled the game. There was only one negative in Tech’s 40 minutes of basketball in south Florida. With 13:47 remaining in the game, Robinson missed an off-balance layup and stayed down on the court after the shot. After attention from the medical staff, he walked off the court on his own, though he was limping. He went to the locker room to receive treatment, and though he returned to the bench shortly thereafter, he did not get back in the game. It’s important to note that Virginia Tech led by 14 when Robinson exited, and they did extend their lead to 21 with him off the court before getting sloppy over the final few minutes. No update was given on Robinson’s injury on the postgame radio show, though it did not appear to be one that will keep him out for an extended period of time. He was in a walking boot following the game, though these days players with minor injuries often wear boots as a precaution. Virginia Tech returns to action on Saturday when they take on No. 22/23 NC State in Raleigh. Tipoff is scheduled for noon, and the game will be televised by Raycom. Check your local listings for TV availability. That feels a lot better. We found the basket at someone else’s gym. +2 on the home/road situation as you like to say CC. We need the cushion though because we have Louisville, UVA and Duke at home. It’s interesting that we seem to have one of our key players disappear in the scoring column most every game. Tonight it was KB. 9 boards though which was nice. That’s the great thing about having multiple weapons. Can’t guard them all. Going to make the trip to Clemson next Saturday. Haven’t been there for a basketball game, just football which only happens once every 10 years or so. Clemson is great venue; you’ll enjoy it. ROAD WIN! Hope 5 is OK.